Twitter is hiring a Legal Counsel – Law Enforcement and Safety in their SF offices. and check out our career transitions page. Silicon Valley and Washington are on a collision course. 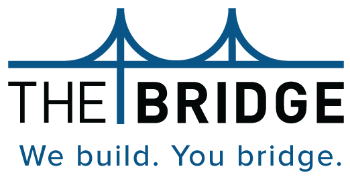 The goal of TheBridge is to make the relationship between politics and tech as smooth and productive as possible, and we think that starts with helping to understand what makes the two worlds tick. We send job updates, news, and people profiles to your inbox on Tuesdays and Thursdays. Written by former Congressional press secretaries. Cirque du Soleil’s touring show Michael Jackson: The Immortal has just added 17 additional dates ** to its 2011-2012 tour schedule. Tickets for the current dates & newly added dates are on sale now. The new dates will bring the hugely successful show to Boise, Minneapolis, Cleveland, Washington DC, and many other metropolitan areas, giving even even more audiences the chance to catch Cirque du Soleil’s latest spectacle in the flesh. Unlike your average Cirque spectacle, this is an arena-only show, and it’s the perfect chance to celebrate both the music of the late Michael Jackson, and the visual expertise of the Cirque du Soleil. “From the moonwalk to the iconic choreography we’ve seen in ‘Thriller’ and ‘Beat It’ and ‘Bad’ — all his mini-movies and music videos — mix that with the world of Cirque… You shake it and can literally turn it on its head. Imagine taking the moonwalk to new levels, to new heights. Being able to do the moonwalk literally as if you’re on the moon, all the way around the arena.” – Jamie King of the Los Angeles Times. The extra dates now bring the total number of North American tour stops to 47, and new tickets have also been released for many of the already-announced dates. Be sure to check the Cirque du Soleil website for full ticket details, and for the special club-member pre-sale. 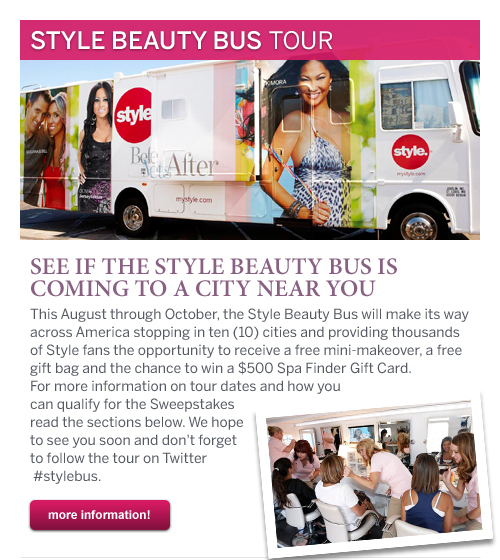 It’s a pretty procession when the Style Beauty Bus rolls through a town near you! We’re hitting the road this summer armed with the latest information on skin cancer prevention and tons of skin care tips, so be sure to come by for a Reveal Imager photograph, your complimentary mini-makeover and a fabulous gift bag. Check the schedule below to see if the stylish tour is headed your way—more dates will be announced soon! Detroit: September 2-4 :: Sneak a peek at the scene! Cleveland: September 10-11 :: Get the photo gallery! Go to Style Beauty Bus Tour for more information. Join us for Passport DC 2011, an exploration through Washington, DC’s international culture during the entire month of May. Now in its fourth year, Passport DC invites participants to experience a global journey without leaving the city. Featuring street festivals, open houses, embassy events, special performances, and much more, Passport DC explores the international community that is a vital part of DC culture. Tours will take place rain or shine! Download the Passport DC Program Guide. Please note that Embassy of the Republic of Uzbekistan is no longer participating on May 14. May 14 – Cultural Tourism DC presents the fourth annual Around the World Embassy Tour, the capstone event of Passport DC. Thirty-four embassies from around the globe will open their doors and welcome visitors to experience the art, culture, cuisine, and much more. Learn all you need to know about the Around the World Embassy Tour. Download the 2011 Passport DC Map! View our interactive map of participating embassies. Shortcut to Europe: EU Embassies Open House: May 7 – Tour inside the embassies of the European Union member countries and discover their distinctive cultures. Kids World Cinema: May 13-14; 20-22 – Young cinema fans are sure to enjoy this celebration of children’s films from countries around the world. Presented in partnership with Alliance Française de Washington, this two-weekend festival features the screening of international children’s films as well as educational workshops. National Asian Heritage Festival: Fiesta Asia Street Fair: May 21 –The National Asia Heritage Foundation, presents this street festival honoring the diverse cultures of Asia. Meridian International Children’s Festival: May 21 – This festival introduces the next generation of global travelers to cultures around the world. View the Passport DC brochure. Subscribe to Cultural Tourism DC’s Weekly Events Update to receive updates and information on Passport DC 2011.